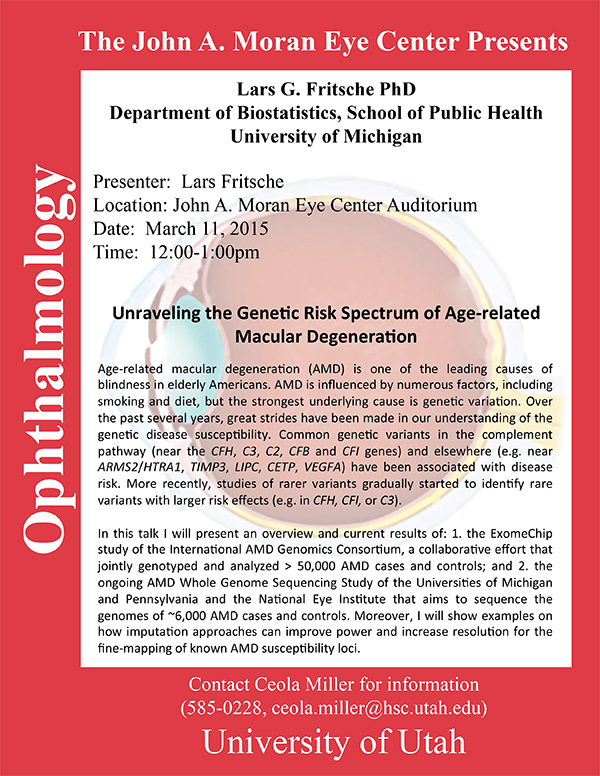 Lars Fritsche from the Department of Biostatistics, School of Public Health, University of Michigan will be delivering a seminar on Unraveling The Genetic Risk Spectrum of Age-related Macular Degeneration on Wednesday, March 11th, 2015 in the Moran Eye Center auditorium. Age-related macular degeneration (AMD) is one of the leading causes of blindness in elderly Americans. AMD is influenced by numerous factors, including smoking and diet, but the strongest underlying cause is genetic variation. Over the past several years, great strides have been made in our understanding of the genetic disease susceptibility. Common genetic variants in the complement pathway (near the CFH, C3, C2, CFB and CFI genes) and elsewhere (e.g. near ARMS2/HTRA1, TIMP3, LIPC, CETP, VEGFA) have been associated with disease risk. More recently, studies of rarer variants gradually started to identify rare variants with larger risk effects (e.g. in CFH, CFI, or C3). In this talk I will present an overview and current results of: 1. the ExomeChip study of the International AMD Genomics Consortium, a collaborative effort that jointly genotyped and analyzed > 50,000 AMD cases and controls; and 2. the ongoing AMD Whole Genome Sequencing Study of the Universities of Michigan and Pennsylvania and the National Eye Institute that aims to sequence the genomes of ~6,000 AMD cases and controls. Moreover, I will show examples on how imputation approaches can improve power and increase resolution for the fine-mapping of known AMD susceptibility loci.